If you're a college basketball fan then you've been waiting all year for March to roll around. March means March Madness—the craziest month in college basketball. Alumni and students come out en mass to rep their school and cheer on some of the best players in the country. March Madness doesn't only involve painting your chest blue. 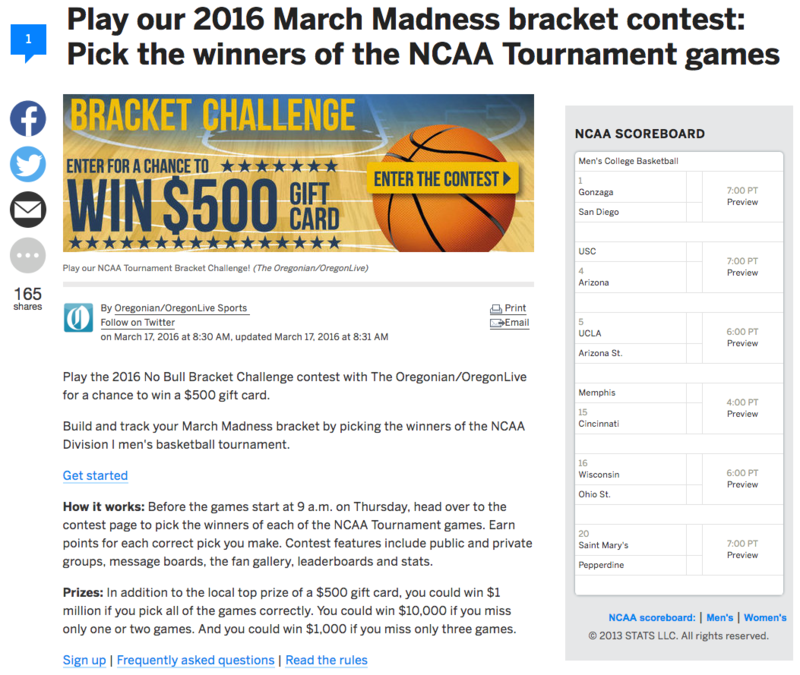 Your business can tap into the March Madness fever by running a social contest. Warren Buffett is famous for giving away a million dollars every year for life to anyone who can pick the perfect NCAA bracket. Luckily, we don't have to go to those lengths to have a little fun with our social media fans. 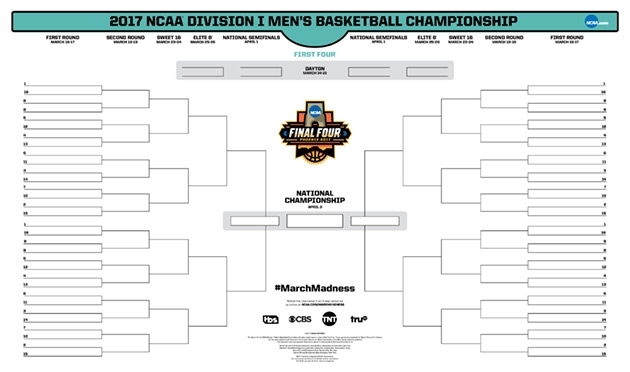 In this article I'll share 16 March Madness contest ideas your business can use to tap into March Madness fever. A bracket picking challenge is the most common March Madness contest you'll see. For this contest, participants submit their tournament bracket picks and the one closest to perfect wins. A contest building tool (like Wishpond) makes creating and publishing a contest easy. Start with a contest landing page. Once you've locked down your design it's as simple as embedding your contest on your website or creating a custom Facebook tab for hosting right on your Facebook business page. Submitting an entire bracket can be a little complicated for people who are not diehard NCAA fans. For this contest, participants submit their final four picks instead. The perfect or closest to perfect wins. If picking the entire bracket or final four seems too complicated, have participants only pick the championship team. The first entry to guess the champion team wins. Participants pick the player who will win the most outstanding player award at the end of the tournament. What's exciting about this contest is everyone watches their player progress throughout the tournament. It adds another element of excitement to the already crazy March Madness experience. Run a photo contest challenge to see who can come up with the most elaborate March Madness outfit. If you use a contest platform (like Wishpond) entry photos can be displayed on a custom webpage gallery on your website for everyone to see. You then have the option of picking the winner yourself or asking your fans to vote on their favorite. Having fans vote lets everyone participate in the fun and have their say. Cheering on your favorite team? Run a photo contest to find out who has the best game day face-painting skills. Like the outfit challenge I mentioned before you can either pick the winner or have fans vote. Judging by how insanely loyal and proud college basketball fans are, you shouldn't have much trouble getting entries. Have a relevant March Madness-themed prize pack to give away? Run a simple sweepstakes to find a lucky winner. Entry for a sweepstakes contest is easy. Participants enter their information and a random winner is drawn at the end of the March Madness tournament. On platforms like Instagram and Twitter, you can create a March Madness-themed hashtag. Then have participants submit content using the hashtag and crown a winner. A contest tool (like Wishpond) makes it possible to display all photos submitted with the hashtag on a dedicated webpage gallery for everyone to see. That way it organizes all the content and let's everyone see who's participating. Before launching your contest a few factors need to be taken into consideration. Specifically the purpose and goal of your contest. How are you measuring whether or not your contest was successful? Followers gained? Leads generated? Revenue generated? Who are you trying to reach? Do your contest theme and rules align with that demographic? How does this contest fit into your overall marketing goals? Is it merely for exposure? Brand recognition? Or sales? Clear and defined goals for your contest will set you in the right direction for a success. If ignored, you risk spending money on a prize and Facebook Ads for nothing more than a few Facebook Page Likes. Have a timely plan ready for the beginning, middle and end to best capitalize on your contest. When choosing your prize, it's vital you choose something that ties itself back to your business. Giving away an iPad might get you plenty of entries, but the majority would just be in it for the iPad. A product, store credit or a gift card make for a much better prize because they're tied directly to the business you run. It guarantees the entries you receive are at least somewhat interested in your niche or what your business has to offer. When your contest is live it's important to remember to update all of your other online assets. Let all of your inbound traffic, website and social media know you're running a contest. Adding a website popup on your blog to let all inbound traffic know about your contest. Adding a bright banner at the top of your website. Changing the cover image on your Facebook, Twitter, and other social channels to promote your March Madness contest. Adding calls-to-action on your blog and email newsletters pushing traffic towards your contest page. Tests have proven time and time again that shorter entry forms perform better than long ones. The reason being that short forms take less time to fill out and don't require as much personal information. If you do need to collect more information, like phone number, it can be collected in the future. A short entry form that collects only email gets visitors through the door and begins the conversation. Once your contest is live, don't sit back and relax just yet. There's promotion that needs to be done. No matter what kind of contest or platform you choose you must remember to cross-promote your contest on every channel you can. If your contest is on Facebook, promote it on Twitter. If it's on Twitter, share a post on Instagram. Don't forget email too. Cross promotion is a vehicle that will give your contest more exposure and attention over time. Contest entries rules that are easy to understand and follow are crucial. The last thing you want is someone who's upset that they didn't win because the rules were unclear. Manage this by making the rules easy to find and read on your contest entry page. Large text and well contrasted colours do a lot to help. Post exact copy on what qualifies as an entry and what doesn't. Here's a guide to writing contest rules. Aside from not giving away an iPad (unless you're in the business of selling iPads) do your best to offer a prize package instead of a single prize. A wide range of prizes will appeal to a wider amount of people. A prize package that includes a gift card and some bonus goodies will appeal to more people than a single prize that someone may or may not already have. In addition to updating all your online assets it's important to provide regular updates to your audience on the state of your contest. You can do this through social media updates, a popup on your website, or through your email list. It'll keep the contest in the minds of your audience and give them multiple opportunities to share it with their friends. Hopefully this article has given you some ideas on how to run a March Madness themed contest for your business. Every social contest needs a theme and March Madness is a perfect opportunity for your business to engage your audience with a social contest. Pull together an awesome prize package, brainstorm fun entry rules, and you'll be ready for game time. Remember, Wishpond's Facebook Contest Apps make it easy to create sweepstakes, photo contests, Instagram hashtag contests & more. Are you pumped for March Madness? Are these contest ideas something you can apply to your business?